Since 1848, the Patriarchate of Antioch has had a “metochion,” or representation church (basically an church embassy) in Moscow. Immediately before he came to America, St. Raphael Hawaweeny served as head of the metochion. Earlier this year, the must-read blog Notes on Arab Orthodoxy published a brief history of the metochion and an interview with its current head, Archbishop Niphon. We’ve been given permission to reprint the history part of the article here. To read the whole thing, including the interview with Archbishop Niphon, CLICK HERE. After Catholic and Protestant teaching and missionary activities in diocese of the Antiochian See expanded and Patriarch Methodius did not see in the Three Holy Hierarchs School that he had founded in Beirut something that would fend off the danger, he contacted Russian intermediaries. They asked him to send a bishop to tour their country and collect funds to repair churches, establish schools and publish books. In 1842, he sent Metropolitan Neophytos of Baalbek, along with Archimandrite Sophronius, the hieromonk Anthimus, and his secretary, Youhanna Papadopolou. In the patriarchal message, it stated that the Antiochian Church had long suffered from poverty and humiliation and so was surrounded by dangers coming from the Catholics who were spreading their doctrines, taking the best churches and monasteries and plundering houses of worship, which became empty as the faithful were languishing on the threshold of ignorance. That which they would collect from the Russian faithful would be consecrated for establishing schools and printing-presses and repairing the Church of Saint Nicholas in Damascus, along with other churches and monasteries. This statement was signed by Patriarch Methodios and Metropolitans Methodius (Homs), Benjamin (Beirut), Ioannikius (Tripoli), Armimius (Lattakia), Zachariah (Irqah), Barnabas (Hama), Jacob (Seleucia) and Isaiah (Tyre and Sidon). The Antiochian Church enjoyed the sympathy of Russian government and people. Leadership of the metochion was subsequently held by a Father Isaias and some Russian monks, until 1879, when the patriarch of Antioch named Archimandrite Christopher Jabbara, a Damascus native, as head. He increased the metochion’s income and erected numerous buildings with the help of Metropolitan Makarii of Moscow. In 1887 the patriarch of Antioch recalled him and until 1889 the metochion was led by the priest Nikon, followed by Archimandrite Raphael Hawaweeny. In 1900, Patriarch Meletius Doumani appointed the priest Alexander Tahhan who, on April 7, 1902 was elevated to the rank of archimandrite. His accomplishments included improvements to the metochion’s building as well as the addition of storehouses and houses. 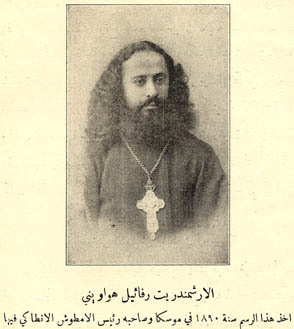 After his election as metropolitan of Cilicia, Archimandrite Ignatius Abu el-Rus was appointed in 1903 and afterward Archimandrite Antonius Mubayyed, until 1920. CLICK HERE to read the rest of this article at Notes on Arab Orthodoxy. Prev : Who was St. Raphael under — Antioch or Russia?